Why are peg dogs no longer welcome in the line? A rare sight: increasingly, peg dogs are being replaced by an army of paid pickers-up. Peg dogs used to be a common sight in the field. Now guns who stand in line with thier own retrievers are at best indulged and at worst vilified. 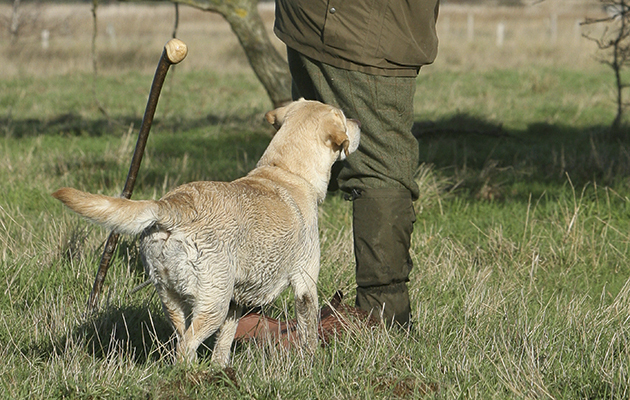 Peter Pennington Legh questions the decline of the peg dog. Peg dogs are often accused of bad behaviour, especially when compared to the far more experienced professional pickers-up dogs. 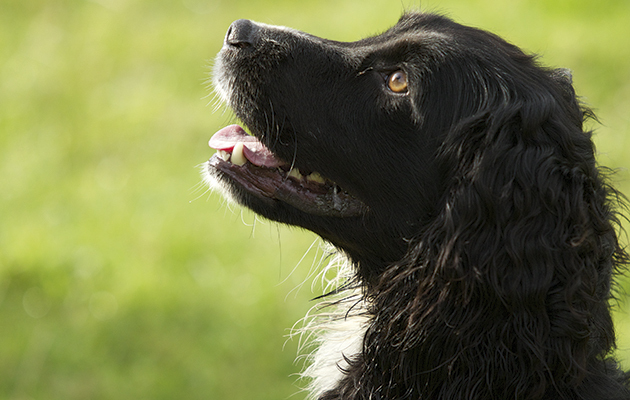 Read gundog schools: private education for pups to prevent any embarassing slip-ups in the field. On Belle Isle, County Fermanagh, on a wooded hill overlooking Lough Erne, are ranks of headstones in a dogs’ graveyard. They are emotionally assigned (if the tear-stained gamebooks for 100 years ago are an indication) the Duke of Abercorn’s hunting and shooting dogs. It is a moving place. As the 2015/16 season ended, I could not help but reflect on what fate many in the shooting fraternity would wish upon the dogs currently worked by guns. Off to the shoot with the dog in the back. 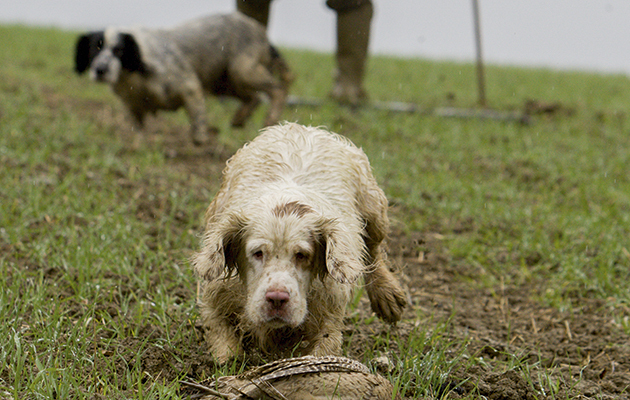 Working peg dogs, in spite of the increasing numbers being trained and sold, are, in practice, becoming a rare sight. So are their owners. Nowadays, guns in a line with their own retrievers are at best indulged and at worst vilified. The habit of taking a dog to a shoot is being lost. Before I am engulfed by howls of “and it’s a good job, too” from the union of pickers-up, I must first vouchsafe that we are all aware days in the sporting field do not follow a singular paradigm. On corporate shoots and the big-name, big-bird days you rarely see a gun with a dog at heel. But in contrast, many family, walked-up, walk-one-stand-one days and farm shoots are incomplete without an excited pack of gundogs. My father and grandfather would recognise these shoots but not the lines of guns on corporate or let days denuded of dogs. Or, even worse, guns with dogs unsuitable or untrained to pick-up the wounded and fallen. Granted, many guns “arrive, shoot and leave”, are travelling. Or they are new to the game or are too busy making oodles of dosh in London to keep a trained dog. But that has always been the case. One has to look elsewhere for the reason. It’s a change in the culture of fieldsports. Peg dogs are barely tolerated on many shoots. Guides to shooting etiquette frequently discourage guns from taking their dogs, “unless they absolutely have to”. I shoot all over the UK and am often the only gun in the line with a dog. Why? The disdain meted out by the shoots themselves (often disguised in a jocular dressing) is the main culprit. For all those deniers who praise Whitfields, Chargot, Castle Hill, Bolton Abbey, Ravenswick or some enlightened moors for their encouragement of guns’ dogs at foot there may be 10 where there is palpable opposition to peg dogs. A bloody nose or two and a lot of name calling is par for this course. Guns and pickers-up were once friends and family. I have many friends who for decades were accustomed to a canine companion. Now they have been hectored and discouraged from working the dogs I know they have at home. One prestigious Devon shoot for which I load has imposed numerous dos and don’ts (to avoid offending the serried ranks of pickers-up). It has been four years since a gun has taken a dog. It is not uncommon for shoots to declare themselves peg dog averse. In truth, most commercial driven-bird shoots are peg dog averse but some hide it. Generations ago, a gun picked-up his own shot prey, especially wildfowling, shooting vermin and walked-up. Even during my early days on driven birds, friends and family would bring dogs to join guns to collect what we shot. 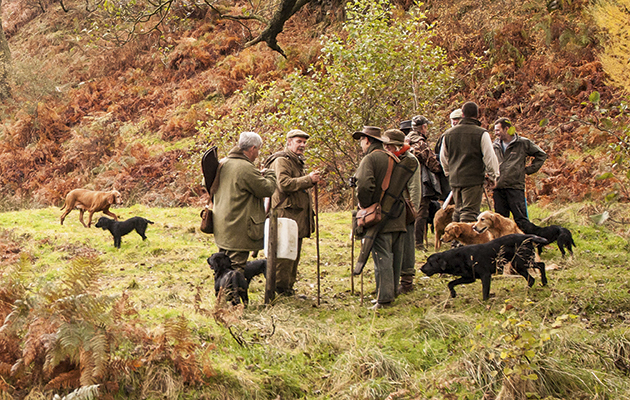 It didn’t matter if it was grouse over pointers or a boundary day around a large local shoot. Pickers-up were family, friends and a few locals who loved a day in the field. In this amateur era we all had dogs. We all worked dogs. It was cheaper that way, too. Driven game-shoots, which adopted the model presented to King Edward VII, have gradually organised themselves over the past 35 years into big businesses. Bit by bit, armies of beaters became the norm and picking-up became a distinct and remunerated activity. The proliferation of those standing behind the line and the burgeoning field-dog trial industry bear testament. With the birth of the professional era guns began to leave their dogs at home. The shoot servants had taken over. My good fortune includes being a member of a syndicate at which peg dogs are both welcomed and expected. For 10 glorious days each season, spaniels and labradors sit quietly at the foot of most guns, immobile until the horn announces the drive’s end. Trained to the command or roped to a corkscrew, there is no running-in or around. We wait, pick up a few birds around us then have a drink. Perfection. The pickers-up here are not offended by the relationship between the wholly separate species of peg dogs and pickers-up dogs (“never the twain”). Such accommodating driven-bird shoots are increasingly few. In their place are intemperate, short-fused shoots. At these the courtesies of a bygone age are elbowed aside for the mob of pickers-up who gracelessly allow the guns to pay huge sums to provide the dogs of others (obtrusively too close behind) with the separate sport of picking-up. Not only do they get the birds for free but they get a handsome per diem. So handsome that it has attracted the interest of HMRC. It’s their sport (with a conspiratorial nod towards the beaters). Woe betide a gun who thinks otherwise just because he has parted with a four-figure sum for the day. And another four-figure sum for the offspring of some field-trial champion. In many cases, gone is the kindly, patient countryman intent on holding back his dogs until the whistle, happy to permit the gun’s hound to collect a few adjacent birds. 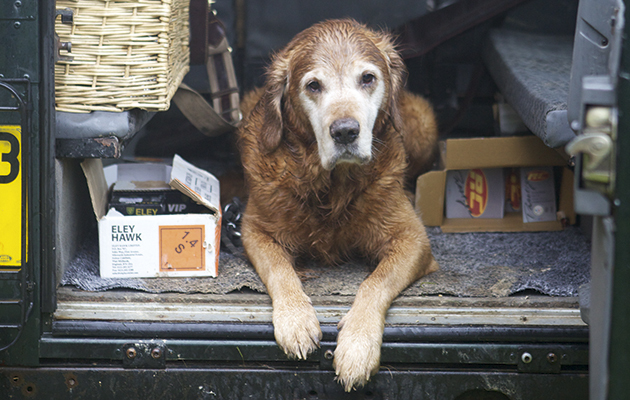 More frequently, pickers-up will work their dogs during the shoot or hoover-up all the birds on the drive before turning their attention to runners in the wood and remote pricked pheasants. Many take pleasure, often goaded-on by the host or shoot captain, in berating a gun’s dog for some misdemeanour or faux pas. Chastisement of guns and their ostensibly errant retrievers is the order of many a day and shoot. Shame on them for their prejudice. Peg dog watches as the picker-up’s dog retrieves. This is a shame. As average daily bags on let days become smaller there must be less need for so many pickers-up. And more time between drives to pick the birds. There are clashes between the tribes. Often they are attributed to a peg dog’s anxiety to please (having marked the fall of a bird). But they are usually caused by the pickers-up not surrendering a little bit of the field to peg dogs. The dogs of pickers-up understandably resent the intrusion and what looks to them like thievery. Unfamiliar peg dogs running over “their” territory in ignorance of the pack pecking order. The causal culprit is best illustrated by imagining an established team of pickers-up and their companion team of dogs (The Sharks) turning up at “their” shoot to be met by another team similarly engaged (The Jets). Most commonly the friction is (I freely admit) the fault of the gun and his sofa-pet – less experienced than the 80-day-a-year professionals and less well trained. My crime sheet this year consists of two torn heads in tugs of war – both on birds I shot –three growling episodes, the occasional snapped reflex, raids on piles of birds and a frustrated swipe at a useless pet that could not make its mind up what to do with a bird it was surprised to find in its mouth. Guilty as charged. On the far smaller credit side were days when my lab filled-in when pickers-up did not show, seduced into working for a nearby oligarch, and a day when the only dog that could swim to pick duck from a lake was a peg dog. There is little point in my experience in asking most pickers-up to cut the peg dogs a bit of slack. And no point in asking for mediation from the shoot captain, estate manager or owner. You and your mutt by merely attending have crossed the line to eternal damnation, where the very wailing and gnashing of teeth is further proof of the unsuitability of peg dogs. I referred earlier to the death of the old courtesies on shoots. These include every aspect, from the chummy “good mornings” between opposing platoons attached to leads, the Edwardian faux-respect towards those who pay for the day to the “I have been there” appreciation that all dogs can (heaven forbid) disobey or misbehave. In their place is a disdain exemplified by pickers-up who stand with a dog immediately behind a gun who has indicated a desire to pick up a few of his birds, refusing to let a gun’s dog work. Such bullying of day-trip “trespassers” is now commonplace. There is also a trend towards “do as I say not as I do”. Recently, while trying to acquaint a trainee dog with game-shooting, a picker-up encouraged his unsteady spaniel to range all over the place during the drive as birds fell – even where they had not fallen – ahead of the guns and even into the wood from which the birds flew. By the whistle, not a bird remained unpicked. Did the manager and shoot captain reprimand the picker-up? Did he heck.Whatever happened to the conceit that the paying guns owned the shoot for the day? Peg dogs are rarely permitted to pick-up even the birds that fall close to the peg. My father (a superb shot) always counselled me to remember of beaters, the keeper, pickers-up and loaders that a day in the field is their day, too. If he returned now and could run as fast as once he could I would suggest he stops off at the beaters’ hut to remind the pickers-up that it is also a day for the peg dogs. Many years ago when, for some reason, shooting was under threat a gun with unparalleled economy wrote to The Times: Sir, I both shoot and work my dog. If they were to ban shooting I would miss more working my dog. That’s still true in my house. Not that I would miss much many of those employed to toil elsewhere in the same sporting field.